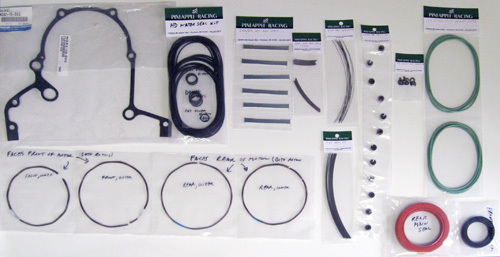 This kit provides all the typical minor consumable internal seals and springs required for a quality rebuild. All parts are genuine Mazda factory, except for the substitution of our Heavy Duty Water Seal Kit. Kit includes apex seals (OEM 2mm, 2 piece), long & short apex seal springs (OEM) side seals (OEM), side seal springs (OEM), corner seals with plugs (OEM), FD-style corner seal springs (OEM), oil control ring o-rings (OEM), oil control ring springs (OEM), Heavy Duty Water Seals, front cover gasket (OEM), front cover o-ring (HD), front cover o-ring backup washer (OEM), oil pedistal o-rings (HD), rear stationary gear o-ring (HD), front & rear main seals (OEM) and more. The options above allow you to add Bearings, Rotor Housings and Oil Control Rings to your order, which are otherwise not included. Bearings are generally replaced on a quality rebuild, but not always required depending on the condition of the existing bearings. Installation requires a press and special adaptor. Rotor Housings are very, very expensive but are mandatory for any rebuild expected to last as long as the original engine. Used housings should be carefully inspected prior to re-using, in any event. Oil control rings have a fairly long life and can be re-used if within specification (0.020 inch or 0.5mm) of wear. Just measure the shiny part on the wear surface. While the rings themselves are not included in the basic rebuild kit, please note that the oil control ring o-rings and oil control ring springs ARE included. If you do any price shopping, please remember that many places will sell you a rebuild kit with substitute aftermarket parts that are inferior to OEM. The most frequent substitutions are apex seals and oil control ring o-rings. Please don't fall for this. No aftermarket metallic (as opposed to ceramic) apex seals or oil control o-rings come remotely close to performing as well as the OEM parts. This is why we don't offer them. The only substitutions we typically recommend are premium ceramic apex seals (only for extreme applications) or the Heavy Duty Water Seal Kit (for all applications), which we tested for 7 years in a variety of engines on the street and track before offering to the public. For $99 less, we can substitute the stock water seals with this kit, if you prefer. We normally do not recommend the use of the stock oil pan gasket because it tends to leak worse than silicone sealer alone, but it is available for those who really want one.